There is a powerful lot of friendship going on with the Bread Baking Babes and this special group was invited by our Kitchen of the Month, Judy of Judy's Gross Eats, to bake Power Bread from Peter Reinhart's Whole Grain Breads book. She made a wonderful choice because this bread is complex, slightly sweet, with a nice chewy texture and moist crumb. There is even an unusual ingredient... sunflower seed flour. Before you get too worried that you can't make this bread because ...well who can find sunflower seed flour in the store anyway?... I can tell you that you'll be OK if you can lay hands on a blender or food processor. This bread does require a bit of advance planning. You make a pre-soaker and let it sit on the counter, covered, for a day or so, and there is a soaker and a biga that both get made and they also need some time to ripen...on the counter and in the fridge. I also chilled the finished dough, before shaping and before baking but after shaping, so that I could do the other things that life has been bringing me and not have to bake the bread at 4 am or something. 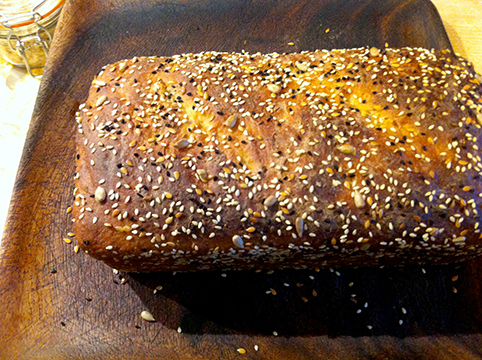 This is an handsome, delicious, bread with a lovely crumb and wonderful fragrance. Because I'm not supposed to have a lot of whole grains, I used white whole wheat flour for the soaker but used regular bread flour for the rest of the recipe. Also not supposed to do a lot of sesame seeds. I didn't add sesame seeds to the dough, but I did line the pan and sprinkle the top with a mix of seeds. I had to cover the top of the loaf with some foil during the last 15 minutes because it got pretty dark and I was afraid that the seeds would burn. Thought there would be some oven spring but that didn't seem to happen. Fortunately it rose fairly high in the pan, so it's a nice loaf, even if the top is a bit flatter than I would like. I used the mixer for most of the kneading. A repeat of an intestinal bug has shown up and it comes with extreme fatigue. I think Sweetie was surprised that I even tried to bake this bread, but it really is an easy bread...it just takes time. Bet you want to try making it yourself. Awesome toasted! Check out the other Babes who baked this one and see their variations. They have some really gorgeous breads this month! 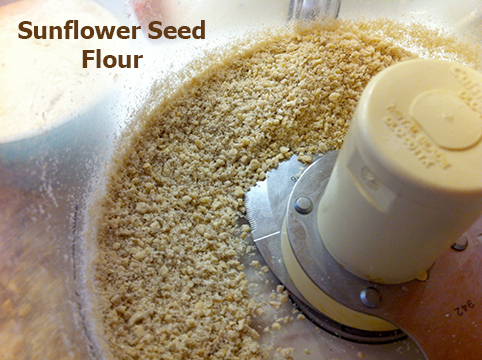 Dust your counter (or whatever you're using) with flour, and roll the dough around in it. Knead it for 3-4 min. Let the dough rest for 5 min, and then knead for another minute. At this point your dough should pass the windowpane test. If not, knead more until it can pass the test. Then form your dough into a ball, place it into a lightly oiled bowl, roll it around in the oil, and let it sit covered at room temp for 45-60 min (until it's about 1.5 times its original size). Lightly flour your counter again, and form your dough into either a loaf shape or rolls. Put the loaf-shaped dough into a lightly oiled 8.5" x 4" loaf pan, cover loosely with plastic wrap, and let it sit at room temp for 45-60 min (until it's 1.5 times its original size). Or, if making rolls, place them on a sheet pan lined with parchment paper or a silicon mat. Preheat the oven and a steam pan (an empty metal pan on the bottom oven rack) to 425. Put bread in the oven, pour 1 cup hot water into steam pan, and reduce oven temp to 350. Bake for 20 min. Then remove steam pan, rotate bread 180 degrees, and bake for another 20-30 min, or until loaf or rolls are brown, have an internal temp of at least 195, and have a hollow sound when thumped on the bottom. Remove the bread from the pan and let cool completely (at least 1 hour) before serving. Lovely crumb and texture! Powerful bread for powerful Babes. Yum. Just looking at your bread, especially the toast, inspires me to make this bread again! Thanks for baking in spite of all your adversities. Your bread looks great. Love the seeds on top. I do hope you are feeling better soon! I made mine mostly in a spiral mixer too. Wow! I felt tired just reading the recipe and almost bailed out. You are a hero to have made it if you already feel tired before even looking at the recipe. Your bread looks wonderful. I like the idea of putting the sesame seeds on the outside. I hope you're feeling much better very soon! Brave that you made this even though you are not feeling well. 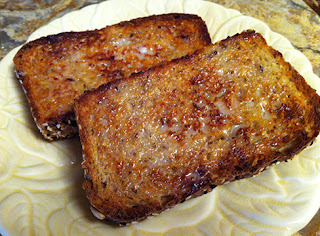 Your bread looks great...and that toast:wow superdelicious. I hope you'll feel better soon. 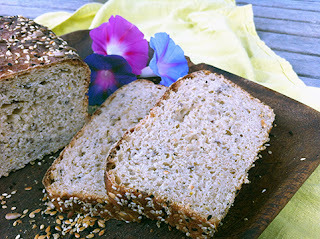 This looks SUPERBLY tasty, though you know me; I'm all about the seeds and grainy breads. And you're right - you can't find sunflour seed meal in the store, likely because its fat content means it would be rancid within a day or three after being ground - much better to do things this way. It looks amazing! Love the looks of that toast! I truly hope you get over this bad patch soon Pat. Tired is just not you. I am right with you on the toasting ... it was wonderful as toast. I love the sesame seeds on top, great touch. I wished I'd had some to use, I used all mine in the recipe.